Recently, one of my favorite ladies - who also happens to be a blogger buddy - (and who I've mentioned here over and over again...) presented me with an award! Miss Olivia over at Of Such is the Kingdom called A Foreign Land "A Blog with Substance." How much of a compliment is that? I desperately missed my friends and family. I guess there’s really no need to change its name because it’s still as true about where I am as it was the first day I posted. I'm still living in a foreign land it’s just that now I know I would be no matter what my zip code was. Seriously, there have been some HUGE changes in my life in the past few years. I was able to grasp that maybe a year ago, when I posted this. What’s foreign about “my land” is that I'm married, I'm sober, and I’m a Christian. It’s foreign that I take responsibility for my yucky stuff and I want to change it. It’s foreign that I love the not-so-yucky stuff about me because I'm a unique creation NOT because I'm trying to prove something. So, readers, please know that the title “A Foreign Land” has been officially de-snarkified. It’s no longer spoken with condemnation toward my surroundings. Instead it communicates the awareness that I'm very FAR from certain how to successfully navigate this life that I’ve been gifted. I'm just taking it one day at a time and CHEERFULLY trying to negotiate my foreign land. That basically is what this blog is all about. My writing chronicles the path (chock full of mis-steps) that I'm navigating. Some days I'm thinking about what I'm wearing or watching while other days I'm thinking about what I'm becoming. And most recently, this blog has turned out to be a gateway to a community of other fascinating people! Which, really is an extra added bonus. Ok, so now I've gone on and on about me and A Foreign Land. 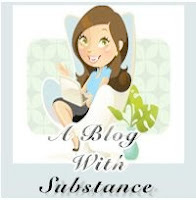 I believe it's high time to bestow an "A Blog with Substance" award on a few other talented bloggers. My Place in This Blogging World: Since I happen to know the author of this blog personally, I can attest that she is the real deal. Her honesty and transparency are both a blessing and an inspiration. Hope Chella: This (sorta new to me) blog has been a real treat for my eyes. It's full of images that she finds inspiring which she then posts to keep from "cluttering her desk". I never know what I'll find when I visit, and since a picture's worth a thousand words, it's clear Hope Chella has a LOT to say! The Daily Snapshot: I'm a little bit embarrassed of how many times I've starred this blog in my google reader. Between recipes and book recommendations (See What I'm Reading Now!!) she keeps me busy! And she hasn't steered me wrong yet. Now I'm excited to check out what these three have to say about their blogging philosophy.